« Older: What do I want to learn about learning? On a few occasions, people have introduced me or linked to me as someone who’s super-productive. This is weird, because I think my life is pretty slow. I intentionally keep it that way. I minimize commitments. I get plenty of sleep. I follow my interests. I scale back work. I consider it a good day if I can get one or two things done, and maybe a few thoughts explored too. I think the only thing that makes me seem very productive is that I write about stuff I’m learning. Most people do just as much or more, but they forget where their time went because they don’t have notes. Anyway. I’ve been thinking about speed because I want to make my peace with this slow pace. I think it’s good for me, although I have occasional doubts about whether I’m taking it too slow, letting contentment cross over into complacency. Sometimes my life moves faster: consulting sprints, for example. Other times, it moves more slowly. 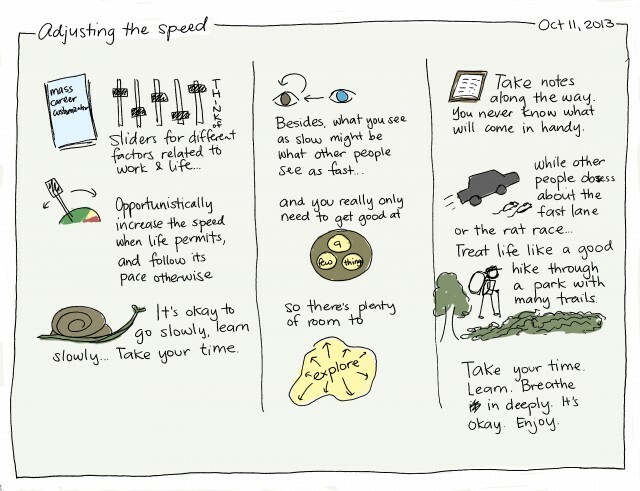 When life permits, I don’t mind going faster for a while. When life permits, I like going slowly too. I like this pace. I can deal with this. I can get good at doing just a few things. I don’t have to do everything or win everything. I can start with a solid foundation and then grow outwards from there. The metaphor you use to think of your life can make such a big difference. Is it about getting into the fast lane? Is it about dealing with the rat race? Is it about taking a hike through a lovely park with many, meandering trails? The last one is the kind of life I’d like to have.